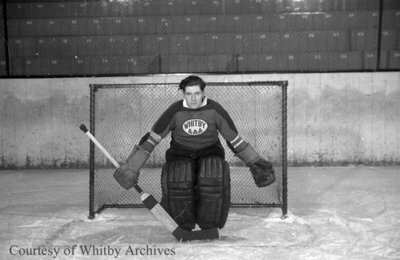 A black and white negative of Bernard Clarke posing in his goalie equipment on the ice at Taylor Arena in Whitby, Ontario. Bernard Clarke was goaltender for the Whitby Amateur Athletic Association Intermediate B Champion hockey team during the 1939/1940 season. Taylor Arena was located on the east side of Brock between Gilbert and Ontario Streets. Bernard Clarke, April 3, 1940, Marjorie Ruddy. Whitby Archives A2013_040_722A.